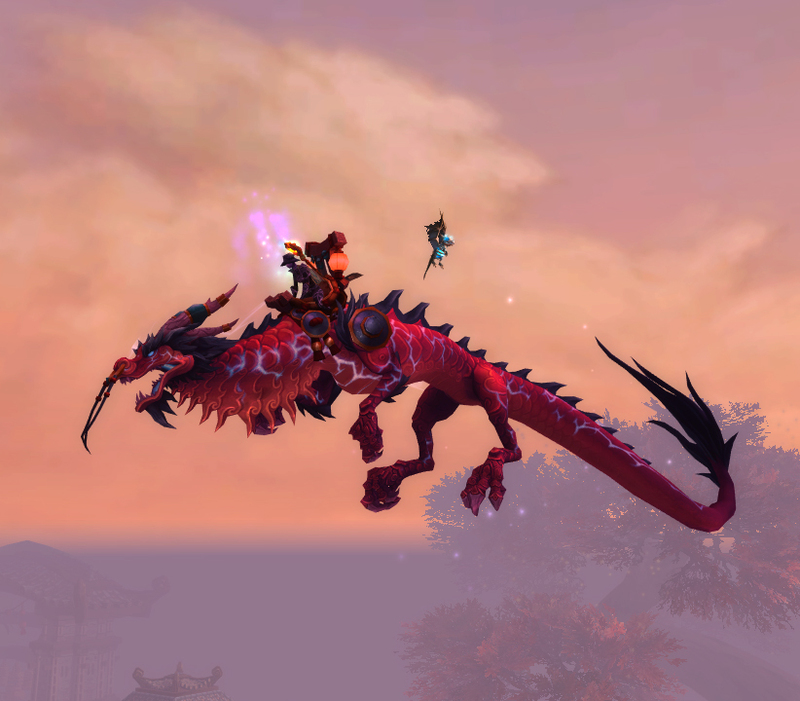 So…you want the Reins of the Thundering Ruby Cloud Serpent? 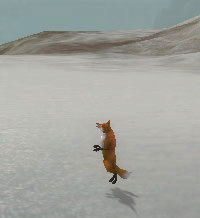 I know I did after reading Tome’s post and seeing Alani flying by me every day…mocking me. With a long weekend filled with nothing but snow and trapped inside with not much to do, I decided to “farm it out” and get my 10 Skyshards to make a Sky Crystal and get that PINK mount. 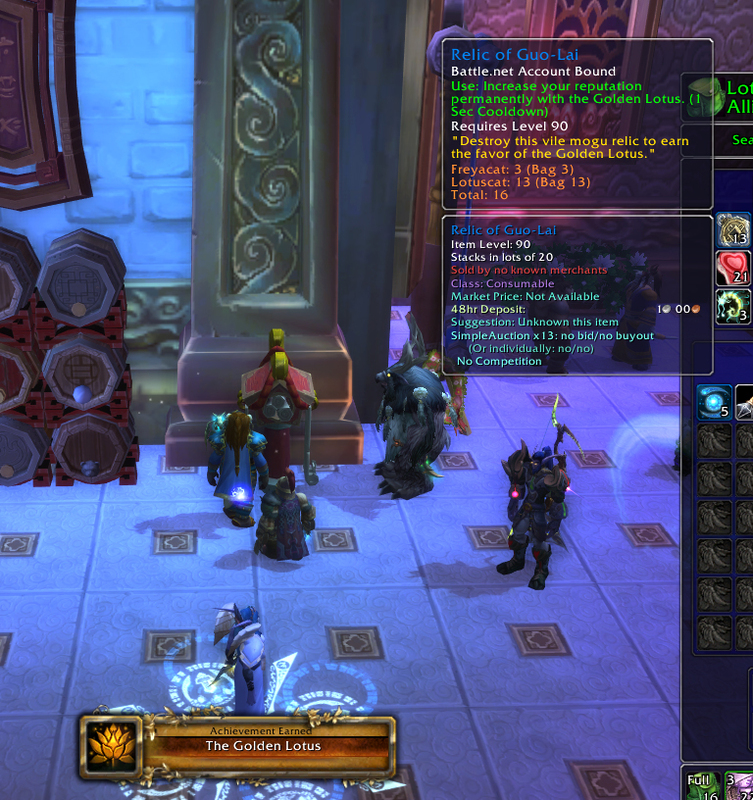 I started with one Skyshard I had drop from Golden Lotus dailies when they first started and hadn’t seen one since. I began “serious” farming for them a couple of evenings last week and found three so by the weekend I needed six more. There are only two viable mobs (purportedly “best” is the 0.4% drop rate) that drop Skyshards – Shao-Tien Conquerors and Shao-Tien Painweavers both conveniently found at Winterbough Glade, Vale of Eternal Blossoms. There is a little circular encampment there with tents and plenty of Conquerors and Painweavers with fast respawn rates. Make no mistake – this is a long, painful and horrible grind. But if we’re crazy enough to do it anyway, my theory is why not make some gold out of it? We can use a few things to get extra loot, gold and other goodies so our time is actually useful until we get a Skyshard. Potions of Luck – 20 minute duration per potion. These will NOT increase your chance at a Skyshard but you will get a chance at extra loot – Plundered Treasures. If you can’t make them yourself, buy a bunch – trust me, you’ll get your investment back. Vendor mount, Scrapbot, Jeeves, etc. – anything “portable” to let you sell junk. There is a mailbox at Mistfall Village but no vendors. Saves you a trip back to the shrine. Engineering character with MOLLY and a pile of Scrapbots. MOLLY has a one-hour cool down and Scrapbots have a 15 min cool down – much better than Jeeves. I could drop a mailbox/scrapbot every hour or so between Potions of Luck to mail off mats to my bank alts, repair and vendor trash. Golden Fleece and/or Golden Moss trinkets. These will occasionally drop a little “pile” of gold (two piles if you have both equipped.) Be aware though, that *anyone* can pick up the gold so if you hear the extra “money drop” sound, pick it up fast! Note: Golden Moss will drop more gold than Golden Fleece. Any characters with maxed out Professions will be useful. Any Profession that lets you craft goods from the mats you get “out in the field” and send of to an alt for the AH will get you a nice pile of gold at the end of the day. Pop your Potion of Luck and go to town. I took my Death Noob (round them all up) and Priest (root and AoE a few at a time) and frankly, didn’t find one method more efficient or faster than the other, so whatever works best for you. I ended up using only my Priest because she was the best geared and had Engineering/Tailoring. With the extra cloth drops from Tailoring I ended up with way over 2,000 Windwool Cloth. Yeah, I own the AH cloth market now. Ancient Guo-Lai Cache Key – you will get a lot of these. I would save them up (20-30 at a time) and if the place got “busy” with other people killing mobs I’d head over to Guo-Lai Halls, loot the chests and send the goodies off to a bank alt. Don’t worry about other people showing up for quests or Skyshard farming. 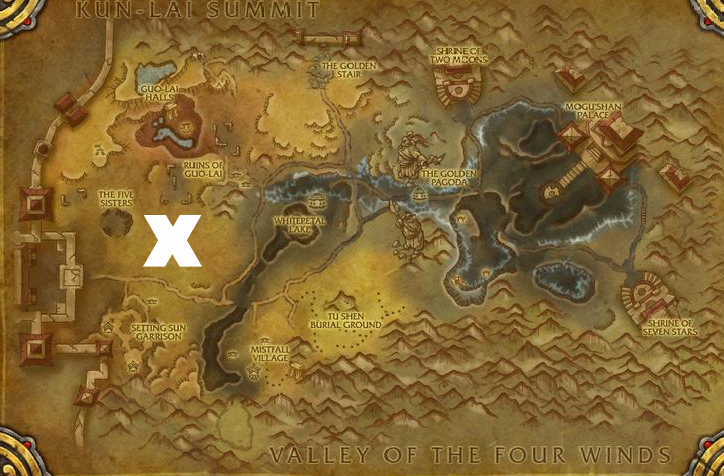 Use the time to loot chests, vendor, send stuff to alts, etc. I noticed a couple of things – the “farmers” would round up all the mobs by the central campfire and not bother with the ones *around* the camp. Those are the ones I would go for and got most of my Skyshards from them. I also noticed that other “farmers” wouldn’t hang around too long – maybe an hour at the most. You can count on other players having a short attention span for farming and/or they are not as crazy as we are. I’d take a break every 2 Potions of Luck (about 40 minutes) clear out my bags and do RL stuff. It helps if you have a pet that demands your attention so you don’t turn into a zombie sitting at your computer. The real fun comes from the Plundered Treasures and Guo-Lai Caches. These will give you enough mats (leather, wool/bolts, herbs, spirit dust, ore) to keep your professions stocked for a long time or sell at the AH. I also got enough Spirits of Harmony (and a few Imperial Silk) to make 3 or 4 Royal Satchels in one day. Guo-Lai Caches also drop the recipes/ingredients and Relics of Guo-Lai/Relics of the Thunder King for Golden Lotus reputation. I picked up enough of these for two characters at Neutral to get Exalted using only the Relics. I’m guessing I would average about 1 Skyshard per 4 hours of farming. 1/1000 mobs sounds about right. I had 9 by Sunday night and since Monday was a holiday, I figured I would burn it out and try for that last Skyshard. I got really, really lucky though and got #10 about 15 minutes after I started. 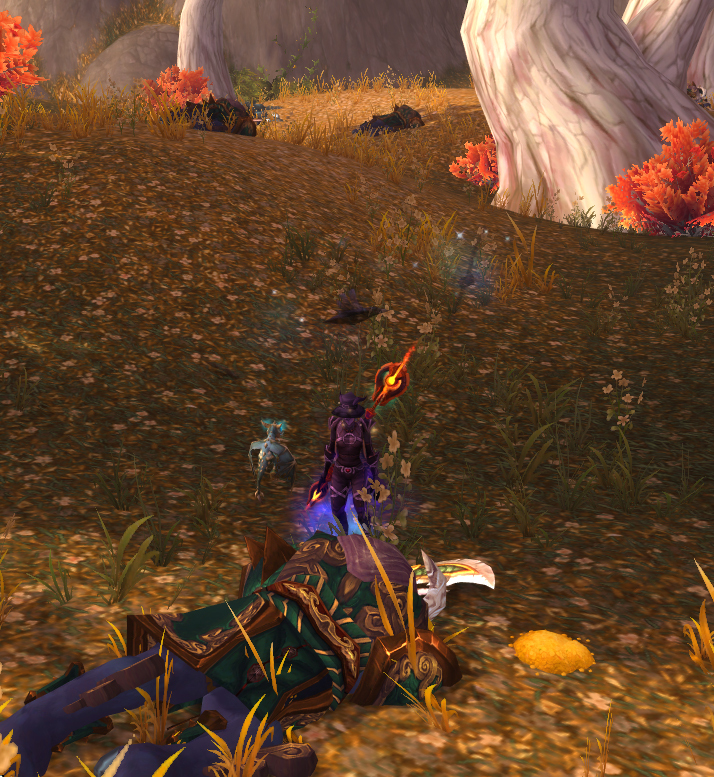 I put together my Sky Crystal, found Alani and followed it around until I found a clear spot to channel the crystal. The Sky Crystal channel takes a bunch of health off so it’s an easy kill. I got my Thundering Ruby Cloud Serpent and so far I’ve made over 20,000 gold from the loot I found while farming for the Sky Shards. Yay! Looking good on that Serpent! I sure wish I’d thought of taking some Potions of Luck along even without them I know Sasche made around 11,000 gold, I didn’t keep track of how much Cim made. Yes, Potions of Luck and Plundered Treasures give a lot of extra mats. I think I got over 600 Exotic Leather and a ton of trillium. Too bad I don’t have a Leatherworker lol. Congratulations on the mount. It looks like you channelled the crystal in the same spot that I did. A very nicely written post too. Well over 200 hours of farming. Not. Even. One. Skyshard. Drop. Got enough gold to buy 4 Orbs of Mystery. 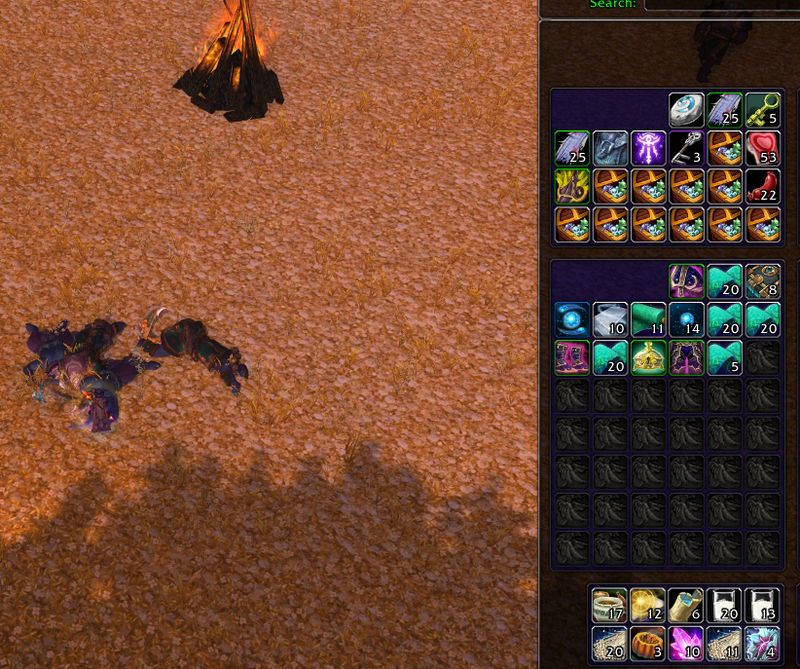 I’m at over 4000 kills and no drops yet….other than the person that took down Alani in the middle of the camp I was farming for shards today -I was inventing some choice swear words as I watched.. Good news…..obviously it can still happen, watching them fly away on their shiny new mount was proof enough. Bad news….I’m still 10 shards away from pulling Alani myself. Two drops so far using this method, both in a couple hours time. RNG seems to be pretty fickle with the damned things, but this guide is fantastic. Thanks for the helpful info! Sky Shards are such a low drop rate it’s dismal and there really isn’t any way to make it easier. The trinkets and Potions of Luck don’t do a thing to help get Sky Shards but at least a little extra gold and mats is better than getting nothing. Good Luck! I’ve got 2 Sky Crystals so far and about 4 towards a third one just from farming the area for cloth and mats. I don’t know whether to sell the second one or give it away for a guild contest prize. Yes they are now until you create the Sky Crystal which is BoP.